Genesis | Comics I Don't Understand - This site is now being updated daily at http://www.comicsidontunderstand.com. Please change your bookmark if necessary, and notify any web site with a link to the old address. Should that read “Creationism isn’t something I support…”? Or is the gag written as intended and I’m missing something? Perhaps the message is that you don’t ‘support’ evolution, it just happens. Natural Selection doesn’t want or need your support to work. I don’t think it was written incorrectly, but that doesn’t mean I get it. Maybe the cleric is referring to Darwinism — survival of the fittest — as another word for everlasting life for Christians. I think he’s saying he prefers seeing the gene pool chlorinated (Darwinism) to just seeing species evolve…with more of their number therefore surviving. He may be referring to “social” Darwinism – which applies the notions of evolution & ‘survival of the fittest’ to social class & status. In essence, “social Darwinism” says that those who succeed in society are those most fit to succeed; and hence those who are destitute and powerless have only themselves to blame. I think it’s a criticism of the religious right’s opposition to evolution while supporting very unChristian social policies that amount to social Darwinism. It’s not really funny, but at least it’s awkwardly phrased. I took it as an oblique commentary on the creationist tendency to conflate evolution with something they call ‘darwinism’, which tends to be a serious simplification and misrepresentation of Darwin’s work, and then treat the latter as if it is actually a codified belief structure or religion and attack it thusly. 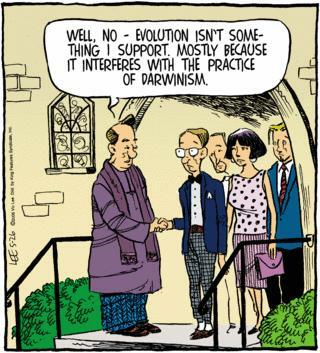 Thus the priest is saying he doesn’t support evolution because he’s invested in the non-existent, strawman religion of darwinism. I may be reading too much into it. His version is snappier, if less clear. Does the joke have something to do with the fact that the guy in a nerd, and his girl is totally hot?